Contemporary Eco friendly design. 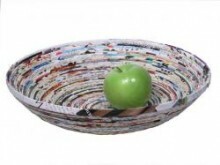 12 inch diameter, 3 inch deep woven recycled magazine paper bowl with food safe, water repellant coating. A great item for everyday tabletop, this lightweight bowl is sturdy and functional, ideal for fruit or for dry snacks when used with a liner or towel. Click the button below to add the Recycled Paper Bowl to your wish list.